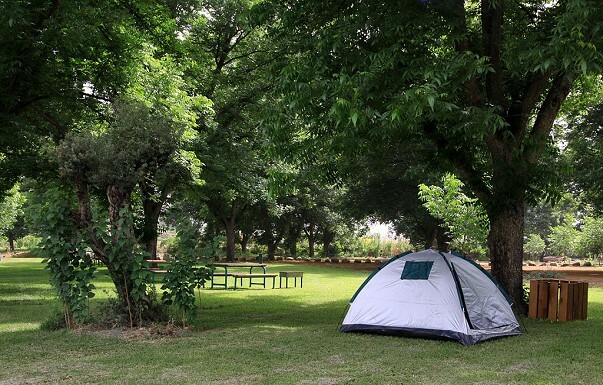 Yarok (Green) Overnight Campground at Beit Hillel in the Upper Galilee provides lots of green scenery with the shady trees and vast lawns – almost a like a golf course. The Henyon Yarok Campground is on the bank of the Hatsbani (Snir) Stream, which means cold water from Mount Hermon. We originally planned just to stay over night, but the campground was so pleasant and the Snir Stream so inviting that we stayed for another day and night. We took a family vote and the children all voted to stay put here. By the way, it is forbidden to play music on the site. No loud speakers allowed! A real pleasure. Enjoy! Henyon Yarok Attractions such as Native American (What we used to call Indian…) style teepee tents, country-style personal tables and barbecue facilities should be reserve in advance. All campers can use the water taps, toilets, showers, electricity and there is vehicle access parking. All day long the staff cleans the lawns, toilets and showers. It is amazing how clean it is. Unfortunately there is no refrigeration. Have no fear – there is a full size supermarket in the mall in Kiryat Shemona only a five-minute drive away. There is an entrance fee, on the high side. Open from Passover until Succoth. Directions: Drive east on road 99 from Kiryat Shmona. 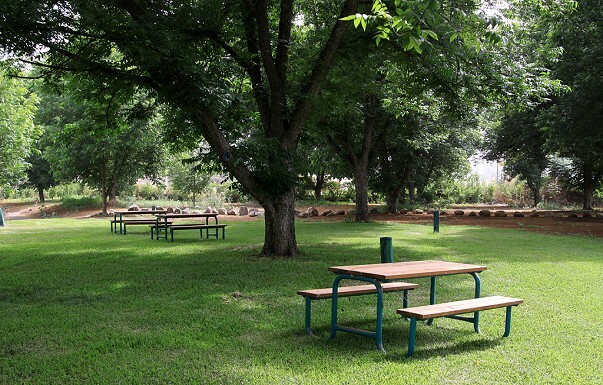 The entrance to the campground is located near the turn to moshav Beit Hillel. This clip will give you the feeling of the shady trees and vast lawns in the campground.